Clara bids farewell to the Snow King and Queen. Different takes on the classic ballet. 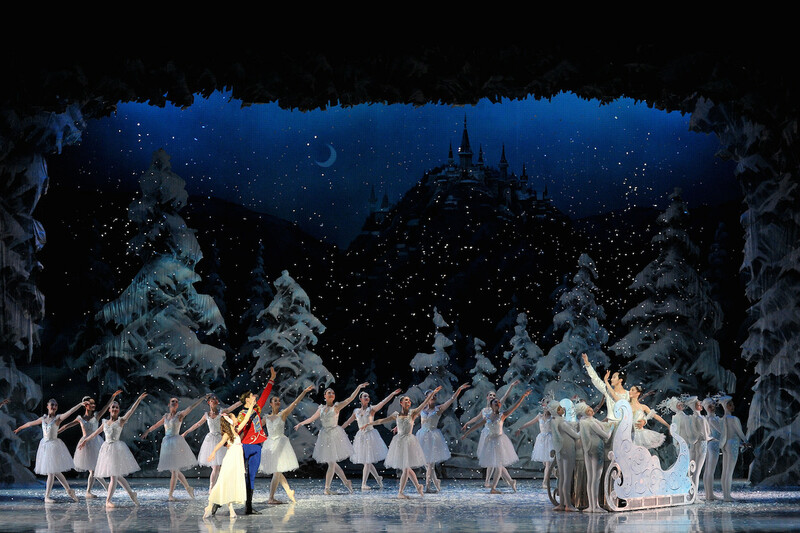 On par with sleigh rides and Christmas markets, The Nutcracker ballet has become a quintessential holiday tradition. Based on Alexandre Dumas’s adaptation of E.T.A. Hoffman’s story The Nutcracker and the Mouse King, the Tchaikovsky-scored ballet of a young girl thrown into an enchanted world has gone through several iterations since its 1892 inception at St. Petersburg’s Imperial Mariinsky Theatre: the heroine has been known as both Clara and Marie, while the story has shifted from Hoffman’s Germany to Russia. As companies across Canada have performed The Nutcracker over the years, some have tailored the tale to bring it a little closer home. The Royal Winnipeg Ballet—which, in addition to hometown shows (December 23–30), also tours Western Canada and Fayetteville, Arkansas (November 25–December 11)—sets the story in 1913 Canada amidst snowy pond hockey and the battle on Parliament Hill, while Symphony Nova Scotia (December 9–18), in an effort to embrace their female-dominant dance community, commissioned a unique version of the story for their inaugural 1991 production, placing their Clara in an all-girls boarding school. No matter the evolution over years or across counties, some elements are iconic to the ballet. Relocation creates familiarity for the Canadian audience, a relatability other companies offer by way of pre-show programs. In Edmonton (December 8–11) and Calgary (December 16–24) Alberta Ballet hosts Sugar Plum Parties (wherein families don costumes from past The Nutcracker productions and enjoy a storytelling experience from characters like the Rat King, among other activities), while Nutcracker Story Time at Toronto’s National Ballet of Canada (December 10–31) provides an interactive performance exploring the story’s themes to enhance the forthcoming show for ballet beginners. Still, many companies honour the ballet’s traditional Russian setting. Vancouver’s Goh Ballet (December 15–20) finds a fresh take by showcasing a diverse cast, this year featuring guest stars from the National Ballet of Canada and Ballet Manila, as well as homegrown talent. Performers total over 200, including members of the Vancouver Opera Orchestra, gymnasts, and local drag queen Symone Says reprising her role since Goh Ballet’s first The Nutcracker in 2009 as Mother Ginger—a towering comic character, often absent from European productions, from under whose mammoth hoop skirt a flurry of clown children spill forth. No matter the evolution over years or across countries, some elements are iconic to the ballet. Even as audiences exit the theatre, the eerily beautiful tinkling of the Sugar Plum Fairy’s tune still dances in heads. Photo courtesy of Goh Ballet. The Nutcracker dates and tickets are available on companies’ websites.